UAE Embassy Attestation is required for candidates who are willing to come to UAE for jobs purpose / higher education and for medical reasons. The documents or certificates which will be submitted to the authorities have to be attested. Many are not aware of Attestation. Agents like us can guide the candidates especially the expats in getting their certificates attested. Attestation on time helps candidates in getting certificates attested from more than 50 countries. UAE Embassy Attestation needs to be completed from the home country before we submit the documents to the MOFA (Ministry of Foreign Affairs) Attestation. The validity of Attestation varies depending on case to case scenario. What are the documents required for UAE Embassy Attestation? This depends upon each document however for most of the scenarios it would be the Original Document and Passport Copy of the candidate. 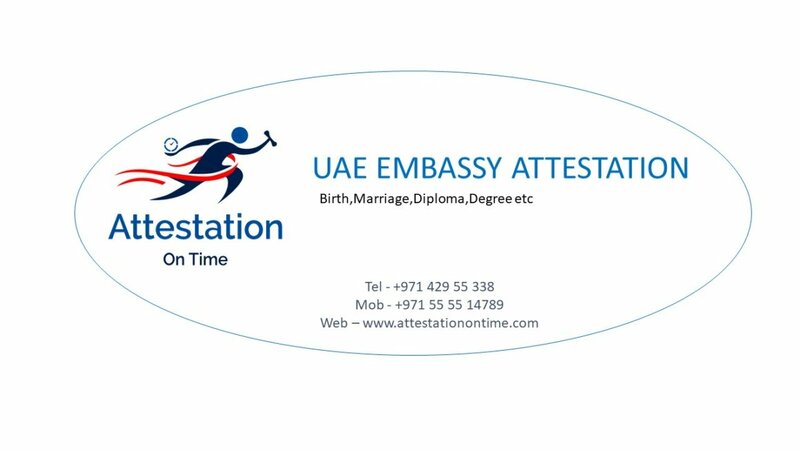 Duration Required for UAE Attestation? This can be answered by understanding which document it is and document issued from which country. UAE Embassy attestation procedures may be complicated but we make it easier for you. All you need to do is hand over your documents rest will be taken care by Attestation on Time. USA Certificate Attestation / UAE Certificate Attestation / Indian Certificate Attestation / UK Certificate Attestation can be completed in short span of time. More details visit www.attestationontime.com or call our customer friendly team at +971556410900.